I know I’m susceptible to these kinds of stories, but there’s no getting around it: I’ve been haunted by a six-year-old for weeks now. Did you guys read the Elizabeth Kolbert article in The New Yorker last month — the one about how spoiled American children are, especially when we compare them to children in other cultures? I was only two paragraphs in before I was reading about a girl from a tribe in the Peruvian Amazon who tagged along on a leaf-gathering trip and pretty soon figured out a way to make herself useful to everyone…by fishing for crustaceans, then cleaning and cooking for everyone in the group. Did you hear me tell you that she is six years old? By paragraph six, the one describing an American kid’s refusal to untie his own shoes, I had to take a few Lamaze breaths to calm myself down. If the mark of successful parenting is, as Michael Thompson wrote in his convincing manifesto about sending kids to sleepaway camp Homesick and Happy, “to raise our kids to not need us,” then sometimes I think we may be getting Fs. Well, in the kitchen at least. Soon after I read Kolbert and Thompson I realized that when I was my oldest daughter’s age (10), I was baking from box mixes on my own whenever I wanted to. I was cracking eggs and picking out the shards that inevitably resulted from my shoddy technique; I was scraping the “butter flavor packet” from the Duncan Hines box into the batter all by myself; I was operating an electric mixer and cleaning up the explosion of batter all over the counter; I was even reaching into a hot oven with nary a grown-up in sight. So I stocked up on box mixes of muffins, breads, cookies and brownies, and issued a mandate to the girls. This is the Summer of Self-Sufficiency, I decreed. From here on out, you may bake any of these desserts whenever the spirit moves you. You are not required to ask my permission. I do not even need to be in the kitchen when you do it. The only rule was that they try to figure out everything on their own. Pretend I’m not here, I told them. Before you ask me where the measuring cups are, try to find them yourself. I trust you, I told them. And I convinced myself this was true. Needless to say, they immediately embraced the challenge and Abby dived right in with a batch of Arrowhead Mills Bake-With-Me Brownies. I was working at the kitchen table doing my best to ignore her as she cracked her eggs, spilled the powdery batter all over the dog, pulled her little stool all around the kitchen to reach measuring cups and mixers and set timers. I wasn’t even looking when she reached into the 350° oven to pull out the pan of brownies and realized that only one of her hands was covered with an oven mitt. Her shriek was Bugs Bunny with an unmistakable hint of fright. I filled a plastic bag with ice and gave it to her. Guess what? She burned her finger. Just like I did the week before when I reached for the baking dish that I didn’t realize was still hot. Just like I’ve done a million times in my life beginning when I was a kid teaching myself how to bake. True, if I had been supervising, it wouldn’t have happened. But if this little experiment is doing what it’s supposed to be doing, my guess is that next time she reaches into an oven, she won’t make the mistake again. So far they’ve tried Arrowhead Mills Brownie Mix, two from Dr. Oetker (apple cinnamon muffins which I’d give a B+ and their chocolate chip cookies, which was more like a C+), and the cornbread from Trader Joe’s (not my fave, sorry TJoe). I like the Arrowhead Mills Bake-With-Me line because they are designed for kids (as opposed to Dr. Oetker which instructed my 1o-year-old to “mix together butter and sugar” without going into any details about creaming. Hence the C+). Have you guys had good luck with baking mixes that are kid-friendly? Let me know so I can stock up. How old are your girls? I have a 6.5 year old and I’d love to try this with her. My mom used to say “all children are spoiled.” I think that rings true when we think of how much we love our kids and the many ways that manifests in the raising of them. My three (boy-girl-boy) didn’t spend a lot of time learning in my kitchen. They did learn to read well and follow directions which gives me great hope that they can negotiate recipes. Now 31, 28, and 26, I love when I’m rewarded with little tidbits of success. A few years ago my oldest visited his younger brother at college. The youngest lived alone in an apartment that I had not seen. I asked the oldest, “how was the apartment”? His reply, “Mom, you wouldn’t want to see the apartment, but you’d be really proud of all the healthy food he had in his frig.” It won’t be long Jenny and you’ll have lots of success stories to smile about. i did read that article… and slumped my shoulders farther down the farther along i read, and of course- took action immediately after… sent it to my husband :). an area that we really need to work on, and we both have been ever since we read this. so, needless to say, i haven’t experimented with mixes that my kids have made on their own, but i will now! Carolyn – My girls are 8 and 10. Obviously, use your own discretion for what age to begin. Some might be ready earlier or later than my daughters for some tasks in the kitchen. Just read The New Yorker article. Couldn’t agree more. Thanks for bringing it to my attention and loved your take on the subject as well. We’re not using many box mixes these days (ah, the joys of sugar and gluten free baking), but Ghirardelli was pretty reliable back in the day. Food is one of the few interests my boys and I share (play trains with you? hmm…let’s cook something instead!) so we start getting them involved as early as possible (they’re 2.5 and 5 now). The illustrated recipes + text are just her level for reading so she gets to direct rather than “just” help me. My guess is that the 6 yr old girl from the tribe did not spontaneously learn how to fish or cook dinner. Her mom or other people from the tribe showed her the first 50 or so times and then she was self sufficient enough to do it herself. I understand stepping back, but I think sometimes we are stepping back too much in our zeal to not hover. I was always in the kitchen with my mom and I remember how she never stopped talking. “I put the gloves on to reach into the oven because it’s very hot, here, you can feel the heat.” “I’m putting a pinch of salt into the water and covering the pot so that it’ll boil faster, here, throw in the salt.” “I’m putting some dishwashing liquid on the sponge and then washing away the suds, see how it’s supposed to look like when it’s clean.” I was cooking by myself by about 12, but up to this day, I can still feel her presence with me when I cook and do things around the house and I smile every time. I don’t think we need to reinvent the wheel. I think we need to hold the reigns, gradually ceding control until our kids have legs strong enough to run, sorry for the mixed analogy. There’s always room to make more mistakes! The first thing I “mastered” making as a kid was Bisquick shortcake. Served with strawberries and (homemade) whipped cream, that was Mother’s Day dessert for years. I think my sister still makes it every year. It isn’t gourmet, but it tastes good and I still like a slice for breakfast the next day. I grew up constantly helping with the chores (I’m from Europe) – in winter it was just doing the dishes and cleaning the apartment together with my sister. In summer – country house with weeding, hay etc. Help in the kitchen usually meant peeling potatoes or turning the meat grinder but my world turned upside down when i discovered that I can bake. That I can have a cake even if my mom doesn’t want to bake. Years after that I still enjoy the pleasure of knowing that I can cook whatever I want and how I want it. I think all the chores in my childhood made me more independent, I knew (and still know) that I can do a lot of stuff if I need to. My kid will not experience all that but I know he’ll have to help me around the house. Now (he’s 19 month old) I like to watch his interest in the kitchen even if it’s imagining that broccoli is some kind of flower and it needs sniffing. Sometimes I let him stir something or give him egg shells to explore. I want him to know how to do stuff. I have been having the conversation about how much more I did at my kids ages than they do with other moms and my husband. My children do not do much, and it is my own fault. My oldest son who is 12 just spent a week at sleep away soccer camp. He is back at camp after a weekend break for a second week. I hope they whip him into shape on how to be self sufficient, but I am not so sure, he is a young and rather lazy 12 year old. I love your idea of “The Summer of Self-Sufficiency” and might just have to implement it in our house. The kids are all old enough, 12, 10, 9 and 7 and it time for me to let some stuff go. I read that article, too, and have the book about summer camp on my list. I’ve been looking into the same issues this summer (my kids are 9 and 11). I’ve also been trying to emphasize mutual responsibility–as in, “you’re making lunches for yourself and your brother this week,” or “you’re doing the laundry; you need to look out for mom’s delicates, and this is how we fold the towels…” etc. One day when my daughter forgot her lunch in the morning, I took a deep breath, refused to go back home for it, and made her share with her brother. They were probably a little hungry that afternoon, but I think they learned a lesson about sharing, sacrifice, and personal responsibility. I read a blog post once – can’t remember the topic – but the info that has stayed with me is “in kindergarten I made my own lunches and so did my sister.” As soon as I read that, I thought “really? Well, if one kid can do it, so can mine!” At that point they were hypothetical children, now they’re 2.5 and 4. And next year my 4 year old will be making lunches to bring to school. Cue the chorus of angels! Having said that, I could be way better about getting the girls to help in the kitchen. Right now there isn’t a lot of time between getting home, eating, and getting ready for bed. Maybe we’ll start w/one meal per weekend. When they’re old enough, we’ll do mixes too. King Arthur Flour (http://www.kingarthurflour.com/shop/landing.jsp?go=Home) has the best mixes for just about anything you want to bake. High quality, natural ingredients, nothing creepy, and the directions are very simple. I nearly always have at least one of their scones mixes in the pantry and the 10 year old has made them on his own. They’ve got a pretty extensive selection of gluten free recipes, as well. We made a sort of pilgrimage there last summer and it’s a pretty wonderful place to visit. They even do school vacation cooking classes for kids. I love this. I’m totally a hovering kind of mom and I’m trying hard to let go a bit. I had a somewhat related epiphany recently when I realized I was cutting up my 7.5 year old daughter’s *cheese omelet* for her. Seriously? That day I handed her a knife and haven’t looked back. Now, chicken, on the other hand…..
My mom was a genius. When I was very small, she would let me help measure and mix the ingredients. I loved spooning flour into the cup and then watching her level it off with a table knife. I learned what it meant to cream butter and sugar. I learned how to stick a toothpick in the center of a cake layer to determine if it was baked. Around the time I turned 7, Santa brought me my first cookbook. Shortly after that, it was announced that if my siblings and I expected cookies packed in our lunches, it would be our job to keep the cookie jar full. My girls are 13 and 16. They have been cooking for years and hate the taste of box mixes. They began with kids cookbooks and recipe cards where I re-wrote the recipes in very simple terms. Recently we discovered my 20 year old niece, out on her own, can’t cook a thing. We brainstormed a list of foods we thought every young adult should know before leaving home. Happily they could cook almost all. We will be having weekend cooking school this fall to teach her. Can’t wait to blog about the list and the lessons. I say, skip the mixes and re-write/simplify the recipes . I learned to bake on my own at 7 or 8 using boxed mixes. First jiffy blueberry muffins and cornbread and then onto some other blueberry muffin that had a little can of wild blueberries and a packet of crumb topping in the box with the mix. I loved it, especially since my mom never loved to bake. We’ve had good luck with ghirardelli mixes, but my kids (all boys, now 11, 13 and 15) usually cook from scratch with either the Williams Sonoma kids cookbooks or Emeril’s. While I find Rachel Ray ick, she does have a good kids cookbook also. My youngest was a mac and cheese addict and has been making his own Annies microwaveable mac and cheese since he was 3. Marion Cunningham’s Cooking with Children is a lovely, well-done first cookbook. Also, forgot to mention that we had the Klutz kids cookbook when we were little and loved making things from the book with my mom or on our own. It comes with a set of measuring spoons that my mom still has. A friend of a friend started Naturally Nora’s, which are pretty good if you think a mix is the way to go. I like keeping a box handy in case I need to bake something in a hurry for a school bake sale. 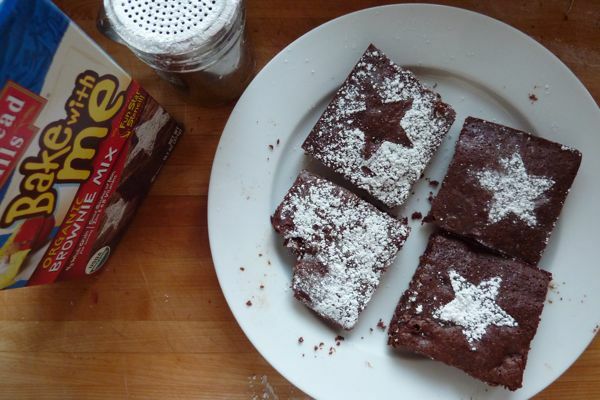 But I agree with many of the comments above: why not write out a simple brownie recipe and let them try it? It’s hard to mess up brownies so badly that they can’t be eaten — you just may need a spoon. As for kid cookbooks, a dear friend gave my eldest girl a copy of Mollie Katzen’s Honest Pretzels at age 7; she’s nearly 11 and regularly makes us dinner. I still help, but try to just be her sous-chef, so that she can hog all the glory at the table. I read that article and then had my husband read it — we now say “machete!” whenever one of us is hovering too much with our six year old…. And I distinctly remember when my (working) mother turned over all lunch and sweet making to us when we complained at ages 7 and 9, and although I ate mustard sandwiches for a year, it did not kill me! I just had a conversation with my 20-year old niece who confessed she can’t cook a thing. My girls (13 and 16) and I brainstormed a weekend cooking class to show her the basics and getting her going on a more healthy cooking life. I just blogged the list and am looking for comments about what every kids should leave home knowing how to cook. Happily my girls can cook just about everything on the list. I began them at an early age helping me and then wrote out recipes on special cards for them and they were off on their own making cookies and brownies from scratch. Now they can read just about any recipe and judge whether it will be any good. I am looking forward to reading your book. My girls and I may try to work our way through some of it this winter. I consider the kitchen my domain, and letting my daughter (and now son) experiment with my two cents has been hard!! I have found success with middle ground…I’m within ear shot to jump and give advice but not on top of them chirping in their ear about the mess they are making. My daughter who turned 12 this month started with box mixes (fan of Duncan Hines Simple Mornings mixes because they don’t have artificail ingredients)….now she’s branched into scones, sauces, etc. She has found watching the Every Day Food videos (http://www.marthastewart.com/899829/everyday-food-sarah-carey) very helpful because they provide the recipe and she can watch the dish being assembled. That’s my two cents 🙂 Enjoy the rest of your summer! My daughter loved the Martha Stewart Cooking School cookbook when she was about 4 — it’s great for a pre-reader (or for anyone learning how to cook) because it illustrates *every* step. Pictures are worth a thousand words, and all that. I love this post. I’m a hoverer in general and know I’ll have trouble not doing so when I have kids. I even hover over Mike WHO IS A TRAINED CHEF when he’s in the kitchen. I mean, who do I think I am? Thanks for the perspective, as always. The TJ beer bread mix is pretty tasty and so easy (you just mix it with melted butter? maybe an egg?) and you pour in one can of beer. it might be worth making just to avail yourself of that tableau–your 9-year-old leaning against the counter casually clutching an empty Shlitz can while the bread bakes away in the over. I read that article, too, a few weeks ago and was struck by it. Hit a nerve, it did, and I agree it’s time to institute a little self sufficiency. My son and daughter (age 9 & 6) have always helped me bake and my son now prides himself in his bacon/egg/toast skill set. Beyond that, however, the cooking repertoire falls short. I, too, am inspired to broaden their culinary proficiencies, while branching out into new worlds of laundry, loaded dishwashers and maybe even clean floors…..
My mom has always been firmly against boxed mixes of any sort, so I never used them as a kid. She had me start helping her in the kitchen when I was four or so (just stirring things or measuring out ingredients and letting me make pretend soup in the sink with peels). I don’t actually remember her ever telling me I needed adult supervision for using the oven or stove, since by the time I wanted to use them by myself I’d helped frequently enough that I never got seriously hurt. Let your kids make some basic recipes–ones from the Joy of Cooking are usually simple. If they can read they can follow directions and messing up a few recipes is a great learning experience; I’m a much better cook for having made some truly disgusting things as a kid. And I forever owe my parents for tasting every single one. I love this post. I am trying hard not to hover as well, but not necessarily in the kitchen. Kudos for your free-range parenting! 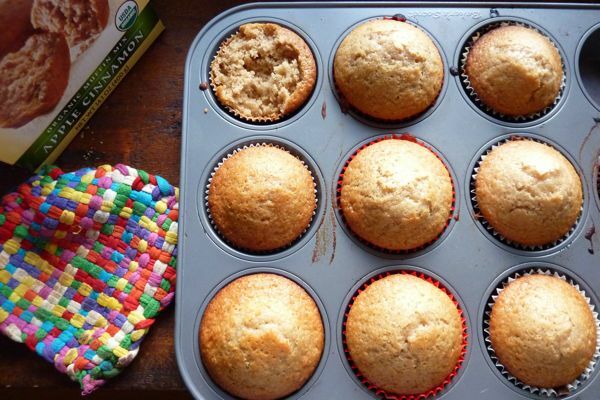 In the mixes category, we’re big fans of TJoe’s banana bread mix (we add chocolate chips and make them muffins; a good opportunity too to teach the “if you add the chips to the dry ingredients they are less likely to sink to the bottom” lesson). Their vanilla cake is pretty basic too. It’s been so hot I haven’t thought of baking much but this is why we have AC, right? For what it’s worth, I definitely remember making chocolate chip cookies (from scratch and following a recipe!) when I was 8 and 9. I don’t remember whether I was allowed to put stuff in the oven, but I do remember that the job included cleanup! Why make them use mixes? There are plenty of simple recipes out there that require very little work and are much better for you than a mix. Oh, and you would actually teach your kids how to bake, not how to open a box. 😉 there is your new cookbook idea for you…. I love that everyone is talking about kids’ self-sufficiency these days. It’s my favorite parenting fad by far! My 9-year old daughter proudly surprised me last night with a dessert of lemon Jello that she’d made herself, boiling water and all. I have been trying to teach her to read and follow directions while stepping back my own hovering. The lessons learned and look of pride is usually worth the mess! Thank you for this post. I’ve always been snobby about boxed cake mixes, but after I read what you said, I put one in the trolley and Mr 8 yrs old made us all chocolate fudge cake. Tasted great and he was so proud of himself. I need to remind myself that they need to learn (and make mistakes) and keep away from being a know-it-all mother. My 11 year old just finished making blueberry muffins on her own for the first time, and she was so incredibly proud of herself. I had no trouble staying away, but my husband was hovering a bit. Thanks for the wonderful idea! You should read the book “Cleaning House” by Kay Wills Wyma…it’s about her year long experiment with teaching her kids to be more self sufficient. Very eye opening. It has changed the way I am parenting my kids! for fear of disturbing the stillness of the cathedral.